Bohle has expanded its range of internal sliding stacking doors with the addition of the Vitris Portavant 150 Multiline. Suited to high-end residential or commercial applications, the multi-track system uses a telescopic mechanism, which enables each individual door leaf to be stacked alongside the other, maximising opened space. Suitable for single-sided or two-sided installations, the system can accommodate spans of up to 6000mm and weights of up to 150kg as a single system and 12000mm with two systems. 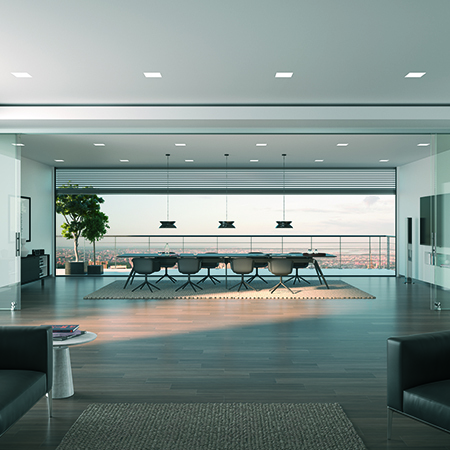 Individual sashes can be manufactured to up to 960mm in width, and as a ceiling-mounted system with integrated guides, the Portavant 150 Multiline also eliminates any requirement for floor hardware such as tracks or guides. Dave Broxton, Managing Director, Bohle, said: “Its telescopic function makes the Multiline ideally suited to a wide range of premium residential and commercial applications. The Portavant 150 Multiline can also be installed into a ceiling pocket in front of a lintel or suspended ceiling. A special swivelling feature on the clamp also means that the cushioning system and the activator remain perfectly aligned even if installed outside of exact vertical alignment up to a tolerance of +/- 2.5mm. The Portavant 150 Multiline can also be installed into a ceiling pocket in front of a lintel or suspended ceiling. A special swivelling feature on the clamp also means that the cushioning system and the activator remain perfectly aligned even if installed outside of exact vertical alignment up to a tolerance of +/- 2.5mm.